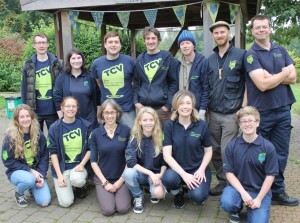 We at TCV Skelton Grange hope to enthuse the next generation with a love of their local natural environment, engaging kids in nature play whilst working with local volunteers to offer a range of education, job skills and recreation opportunities. “No one will protect what they don’t care about; and no one will care about what they have never experienced” – David Attenborough (The Conservation Volunteers Vice President). Skelton Grange welcomes over 6500 people a year to the centre, and our adult trainees lead education sessions for kids and conservation and biodiversity projects for adults. This enables these remarkable volunteers to not only teach young and old alike practical skills and the importance of our environment, it also helps to widen their experience and aspirations, reduce social exclusion, build confidence, develop skills for further training or employment, and partake in positive activities which promote lifelong learning and cohesive communities. When the children come to visit we aim to get them outside as much as possible; experiencing the local environment of ponds, wildflower meadows, mixed woodland and vegetable gardens. When they do finally come back to the centre, after a day of exploration and feeling rather exhausted, we want to give them a warmest welcome possible. This is where the ‘Skelton Grange Green Machine’ comes in. Our community energy project saw the installation of a new ground source heat pump that has made Skelton Grange Environment Centre a warmer, more comfortable place for the community to use, in a way that has a positive impact on their environment. We will also now save money on heating expenditure and we hope to access the non-domestic Recovery Heat Initiative programme, generating further income to support the group’s charitable work. These savings made, and possible income generated, can be reinvested back into our education sessions and conservation and biodiversity projects; improving people’s health and wellbeing along the way. We are very fortunate that things have gone smoothly since being awarded the funds. We ordered the new heat pump before Christmas, and in the first week back after the holiday break, we had it installed. It is now up and running, and our building lovely and warm! It was such a close competition and we are so grateful to our partners, friends, volunteers, local schools, other charitable and social enterprise groups, local authorities and corporate supporters for voting. After a giant effort from the Skelton team, spreading the news via press releases, word-of-mouth, emails and social media channels, we are delighted that people from all of these groups got behind the project and voted for us in huge numbers. We believe that having good ongoing relationships with our community helped to achieve this, as well as having a very defined project that people understood what could be achieved, how many people would benefit going forwards, and how they could help in a straightforward way. Our group remains unchanged in delivering its main line of education, conservation and community work, but is a whole lot warmer now!